Best subject lines for cold emails: how to write them? What Subject Line Will Make My Addressees Open My Cold Email? The crucial question. The question we all should ask ourselves as the very first step of crafting our cold email sequence. Here’s how to choose the best subject lines for cold emails, and how we’ve crafted our subject lines at 52Challenges to make them boost our emails’ opening rates. We need the right key to open the right door. We need the right subject line to open up a conversation with our prospect, i.e. make them respond. Many emails I get every day are trying to use a massive kick on the door instead of a rightly cut key. And if you ever tried kicking a door, you can probably imagine how this usually ends. 2. You crash the door which causes the person to feel extremely pissed off and insecure. They don’t want to talk to you, not to mention do business with you. All they want from you is to get the hell out of their house and never come back. Kicking the door won’t bring you anything good either way. Without the right key, you won’t be able to open the door. Without the key, you won’t be able to show them all the great stuff you have for them. So how do we cut the perfect key? There are thousands of lock types out there. The first step to cut a perfect key is to decide what kind of locks we’ll be trying to open for our product/service/business solution. In other words, we need to know whose door we will be trying to open. Who are the people? Who would they be happy to talk to? What kind of solution do they need? How can we help them if we manage to open their door? To answer all those questions, we need to put ourselves in our prospects’ shoes for a few moments. Change the perspective for a little while. Be them. To prepare the best subject lines for cold emails you’re going to write, discover what they care about, how they talk about their problems, what kind of world views they have. So what was the subject line of our prospecting cold email at 52Challenges.com? We were writing to personal trainers. We wanted them to try out our SaaS. We discovered that one of their greatest pains was getting new clients. We confirmed that trainers love helping other people, and feel very serious about their competence as professional fitness experts. Our subject line was: “I am looking for a fitness professional”. That’s it. Simple, yet relevant. Looks a bit like a message from a new potential client, doesn’t it? We knew the trainers would find it very difficult to ignore a message with a subject like this one. We didn’t use personalization in our subject line, but only in the body of our email. Nonetheless, the best subject lines for cold emails ought to be personalized. They generate high open rates because they feel very relevant. Each key is supposed to work with a particular lock. Crafting personalized subjects including a name of the company, a name of a product, or even better, a relevant title of a blog article is like cutting the perfect keys for the doors of our prospects. Generic subjects like Your opportunity, Web solution proposal, or Website help will not work (yes, you people who sent those to me over the last week – I’m sorry, but such topics just DO NOT work). Your prospect needs to feel that you sent the email exclusively to him or her because you had a relevant reason to do that. They need a reason to open your email. So give them the reason. This is very much about the form of your subject. Reaching out to your prospects you reach as a business person to another business person, which also means as a human being to another human being. If you capitalize the first letter of each word in the subject line, you’re making it feel like a newsletter, not a personal 1-on-1 email. They get a ton of newsletters and generic business offers every day. Why should they open yours when they ignore and/or delete all the other ones. If you are to open their door, your email should feel familiar and casual. Be a friend in need, a guy next door, a person who needs their help. Switch off your inner sales person for a while, if you are one. And if you aren’t – don’t try to be one at the moment. 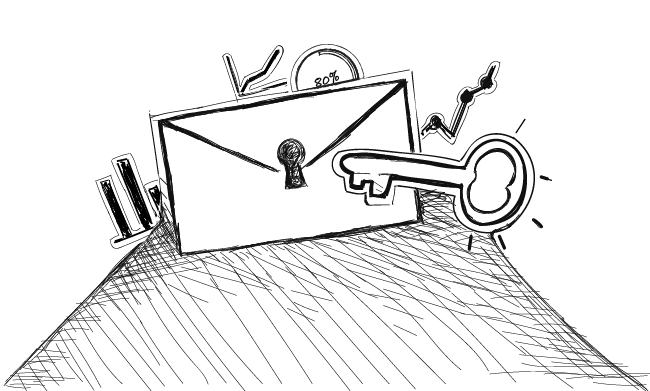 Cold email, and especially the first touch email, is not about selling. It’s about building a connection. It’s about starting a relevant, non-stressing, casual conversation. Don’t make it too long. Don’t make it scream “Promotion! The best offer you’ve ever seen!” Don’t make it feel ‘salesy’. Make it feel natural, casual, and personal. On the other hand, remember that your prospects don’t know you, so make sure the subject sounds polite, not creepy. Your subject line should make them stop and think of an issue they might be struggling with or a question they’ve been asking themselves for a longer time. That’s what you can achieve only if you discover the relevant topics they might be interested in and add to it a bit of well-crafted personalization. Haley Hidalgo in one of her articles at Salesfolk describes three mechanisms that work on your prospects mind and make them open your cold email. Make them reflect on their problem. If the subject line sounds intriguing and relevant, the email will get opened. It’s like when you see a teaser of the next episode of a TV series. You won’t be able to refrain yourself from watching because you feel you need to see the whole story. Make them feel like that when they read your subject line. And last, but not least: be honest. Your great subject has to be logically connected with the body of your email. If it makes a promise, that promise has to be fulfilled in the body of your email. Steli Efti talks about it in another great webinar provided by Salesfolk. The key is crucial. However, if someone has a key to your door, but the someone is not who you expected them to be, you won’t let them to the house. Simple as that. The best subject lines for cold emails are relevant to the email body. If your subject line is not relevant, make it one. Change either the subject or the body. You can always come up with the topic as the body is already put together – that’s how I do this, for instance. You can do this the other way round. Just make sure the two are clearly connected. Would I open it if a person I don’t know sent it to me? The important thing to keep in mind is that your company is unique. Your group of prospects is unique. And your subject lines have to relevant to both your company and your prospects. There’s no way to copy and paste here. You have to discover many details about your prospects and their issues before you will be able to cut the perfect keys to their locks. Previous postWhat Should Be the From Line of My Cold Email? In your personal trainer example, the content of the email was to get them to try your SaaS therefore the subject line “I am looking for a fitness professional” is misleading? this goes against you paragraph below, “be honest. Your great subject has to be logically connected with the body of your email.” Can you explain? Sure, Nick thanks for your comment. The full message expressed by our email was “We’re looking for fitness professionals who would like to test what we’ve got and offer feedback as experts.” So yes, we were looking for fitness professionals after all — I wasn’t being dishonest in the subject line. The thing was that after reading just the subject, my addresees could presuppose I’m their potential client. In the body of my email I gave them the full context of the reason I’m looking for a fitness pro. So the body was a continuation of the subject line — and I think the whole message made sense logically. Sometimes, you can see subjects that are purely shocking or designed to draw your attention just to lose it in the first paragraph of the email. Steli Efti gives an example of such a case in this post http://blog.close.io/subject-lines. If the subject line is dishonest, you will get lots of angry negative replies or you won’t see any replies at all. The effeciency of the campaign I described in the post was close to 30% in reply rate. And we didn’t see any angry replies. I guess the line between the intriguing and the misleading is very fine, so you need to be careful not to cross it with your particular group of prospects.